In the picture with Ann Moss it looks like she's holding a towel. Maybe she got to help dry off her little princess. And I love how 14z's blaze is so unique and distinct. We'll always be able to recognize her! And the black line around the young woman's neck is the old crone's mouth, and the young woman's nose and ear is the old one's eyes. But I only said the young woman's picture looks a little like Z14's blaze with the feather stuck in her hair. But I can also see the bird in the blaze. It's kind of like finding pictures in clouds. This pic warms my heart. Love it. I can't stop looking at the Bunny Baby, she is just the most wonderful Easter present. I have tears of joy every time I see her. Congrats to the Queen and her Team. We love you, Zenyatta, Girl Power is Baaaack! 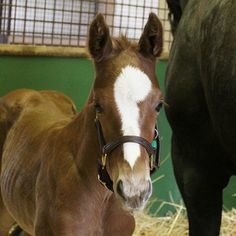 I posted on another thread under this picture that in keeping with the Forum's interest in genetics and heredity, it seems evident that Zenyatta's ears are dominant. I really love those ears. So distinctive. I love it, too. Very distinctive. Just now getting back on the site. I see that she is still BEAUTIFUL! 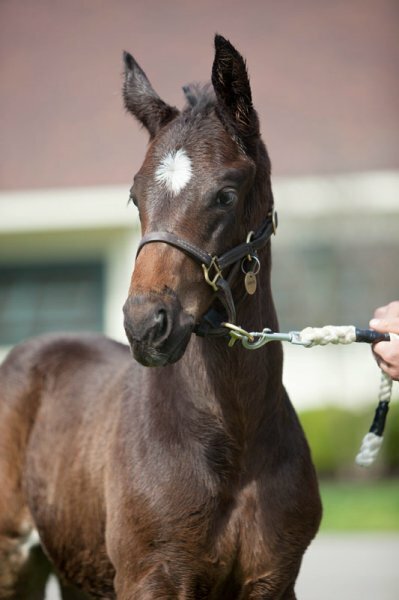 Cozmic One has big ears but I think his sister ears are going to give him a run for his money. 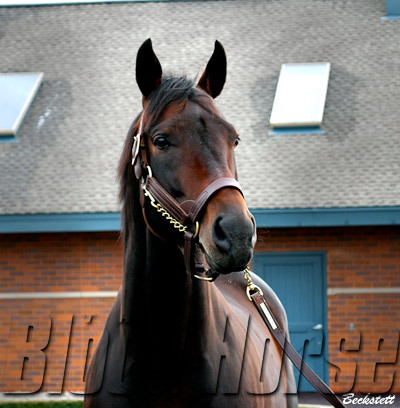 Of the three stallions, I think Bernardini is the best-looking one. I think they're all gorgeous, too. I couldn't choose a favorite honestly. Also, I can't quit looking at the little princess. I love her mane! And her eyes! Everything, I guess. She is so pretty and feminine. My favorite picture so far is the one with Ann and the baby and Zenyatta. Me either! She is just so beautiful... And yes! That mane! She has her daddy's thick, luxurious mane and tail. the Easter Bunny came, and he brought a little girl! She's a little bunny herself. Can't wait to see more pics of her. We're on the same track. I can't stop looking either and echo every word you said. Outstanding collage. Thank you so much...seeing the "kids" each in a roll at about the same age in similiar poses...well just love it! By the way....I see the falcon/raptor/hawk on Princess Z14. I wonder if the Moss' have noticed it, and if not, I sure hope someone points it out to them, it could inspire a name. I've asked Kylea if she "sees" the falcon/raptor/hawk too and if the Moss' have noticed.